This CD has been designed to help children form an understanding and appreciation of music. It clearly introduces musical concepts including beat, rythm, pitch, tempo and dynamics. view song list. This book consists of over 100 sequenced learning activities which accompany the songs, dances and poems on the Jingle Jam CD. These activities have been designed to help children develop many skills including listening, moving, singing, playing and organizing sounds. These lesson plans are easy to follow and an essential music resource. These worksheets help children to learn about musical terms, signs and symbols. Children will match and draw musical signs and symbols, complete find a word puzzles, search for musical symbols hidden within pictures and write musical notes and rhythm patterns. These worksheets are an excellent way to assess children’s understanding of music. In a school classroom, children can complete the worksheets. In a preschool environment, the teacher can complete the worksheets by discussing them with the children then displaying them on their classroom wall. Movement and dance is an essential part of developing a child’s body awareness, fitness and co-ordination. This Dance CD uses the song lyrics to tell you how to move! view song list. This CD has been written in a limited vocal range to encourage children to use their voices in a variety of ways and ‘sing’. The movement and dance lyrics encourage children to use their bodies and ‘swing’. view song list. This book clearly outlines over 100 sequenced learning activities which accompany the songs and dances on the Sing and Swing CD. Move your body, groove to the music and have fun! 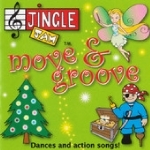 This CD incorporates songs with actions like marching, twisting and stretching as well as character songs like pirates, fairies and giants. This book explains how to perform each dance and outlines related learning activities for each song on the Move and Groove CD. This book has been designed to help teachers and parents to guide children through musical experiences including listening, moving, singing, playing and organising sounds. SING ALONG TO THE WORDS IN THE CD COVER BOOKLET!